A resilient, durable building starts at the building envelope and includes sealing, insulation, and adequate moisture protection. Precast concrete is a multipurpose barrier wall system that can serve as a rainscreen on the exterior and offer an interior finish that dries out if it gets wet and does not require replacement. Durability, strength, and inherent weather resistance are all natural advantages of precast concrete. The material stands up well to most environmental conditions, retains its appearance over time, and is relatively easy to maintain. Precast concrete structures can be designed for 100-year service life with minimal upkeep. Because precast concrete panels are normally large, the quantity of joints in the building cladding is reduced, meaning fewer areas for leaks to develop over time due to joint failure. Fewer joints also reduce the life-cycle cost of replacing joint sealants and add value to the project for the client. Resilient structures are very important when it comes to the health, safety, and comfort of a city. Precast concrete does not off gas hazardous substances, whether wet or dry, which improves indoor air quality. Long, clear spans in a precast concrete building provide plentiful daylighting, adding to the well-being of occupants. Not only does durability mean superior performance in the face of normal, long-term wear and tear, but it also increasingly means the ability to outlast natural disasters. As the United States has suffered from the brunt of superstorms, hurricanes, earthquakes, floods, and wildfires, resilient design has become a top priority. For the eastern portion of the country, the most likely natural-disaster scenarios involve water: hurricanes, flooding, storm surges, and blizzards. Buildings are also stressed by the day-to-day impacts from year-round precipitation, high humidity, and extremely dry interiors of heated buildings during winter. As a building material, concrete is not damaged by water. Concrete submerged in water absorbs small amounts of water over long periods of time, and the water does not damage the concrete. In flood-damaged areas, concrete buildings are often salvageable. Concrete will only contribute to moisture problems in buildings if it is enclosed in a system that does not let it breathe or dry out, and moisture becomes trapped between the concrete and other building materials. For this reason, impermeable wallcoverings should not be used. During hurricanes, buildings face challenges not only from water but also severe wind and debris. Surge, in which large amounts of water rush over the land and up to buildings, carries with it loose debris that can act as a battering ram against a building. In some cases, if the surge is high enough, the debris can impact the building at heights that were not designed to withstand such force. The inherent strength and hardness of precast will resist these impacts. In the Western United States, fire, tornadoes, and, of course, seismic considerations become more of a concern. In fire, precast concrete performs well both as an engineered structure and as a material in its own right. Precast concrete does not burn, and it does not emit any toxic fumes when engulfed by fire. Because of concrete’s inherent material properties, it offers passive resistance and can minimize the fire risk for the lowest initial cost and least maintenance. Precast concrete does not require additional fire protection because it is noncombustible and has slow rate of heat transfer. Precast concrete ensures structural integrity and provides compartmentalization. Single-family homes are under the greatest danger of destruction during a tornado. In regions of the country where tornados often wreak havoc, precast concrete designs can provide a durable, wind-resistant structure. Several key elements are desired in designing a home or structure to resist tornado damage. These include: connections that securely tie the house together from roof to foundation, providing protection for winds up to 130 mph; impact-resistant roof materials that better withstand high winds and fire; windows and doors with higher wind- and water-design pressure ratings; and construction materials and siting work that eliminate the threat of flood or wildfire. Furthermore, precast concrete homes provide significantly more protection from wind-borne debris than other building materials, according to tests conducted by the Portland Cement Association. The group tested various walls with the impact of a 2-by-4 wood stud traveling at 100 mph, the equivalent of wind-borne debris during a tornado with 250-mph winds. About 90 percent of tornados have wind speeds of less 150 mph, the group says. Of all materials tested, only the concrete design stopped the debris from penetrating the wall. All others suffered penetration. A variety of precast concrete components can be used to create tornado-resistant housing. These include foundation walls, load-bearing precast concrete wall panels with an architectural finish, and hollow-core plank for floors and roofing. Precast concrete’s inorganic and noncombustible composition ensure that the housing will not generate mold or mildew following torrential rains, nor will they catch on fire should sparks ignite flammables. Used at its most basic level as shelter from a storm, precast concrete construction meets all FEMA P-361 criteria for safe rooms. These storm shelters must provide near-absolute protection from wind and wind-blown debris for occupants from extreme events. The design wind speeds chosen by FEMA for safe rooms place an emphasis on life safety. Precast concrete storm shelters withstand wind-borne debris protection for wind speeds up to 250mph. With the innovative use of special seismic connections, precast concrete structures can withstand an earthquake and maintain critical operations. So, at its very foundation, a resilient building is one that rolls with the punches. To maximize the future of buildings, they must use materials and construction methods that are durable in the face of natural and man-made events. Resilient design serves to remind us to design to withstand the test of time. The Canadian Valley Technology Center in El Reno, Oklahoma, features precast concrete in two different colors and three different finishes. The community in El Reno, Oklahoma, recently recognized the fifth anniversary of the widest tornado ever recorded in the United States. That tragic event in May 2013, with winds up to 295 mph, devastated numerous homes in the area as well as the Canadian Valley Technology Center (CVTech). 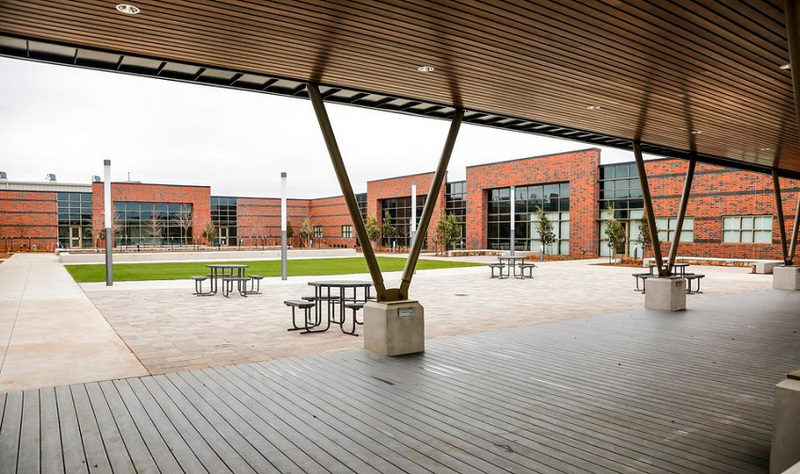 MA+ Architecture had already completed a master plan for the school district but had not expected to implement it so quickly. Goals included building a safe and secure facility that met the needs of all programs, incorporating natural light, creating a facility with maximum flexibility, and redefining the layout to be more collaborative. Using the original master plan, the group had to quickly evaluate various building systems and focus on how to rebuild as soon as possible. The design team considered masonry but was concerned by the shortage of available masons as well as the need to fast track the schedule. “We turned to precast for its speed,” explains Gary Armbruster, principal architect/partner at MA+ Architecture. Precast concrete used at the trade shop portion of Building 100 was selected to create a completely different look and make it more durable. These shops hold training in automobile technology, diesel tech, HVAC, and electrical trades. Because of the abrasive and dirty nature of the training, precast was chosen for to its durability. Another consideration for the selection was the need for low sound transmission from shop classrooms to adjacent rooms. To set apart the shop classes from the rest of the campus, MA+ Architecture worked with Coreslab to develop samples and mockups to achieve the desired finish. Coreslab used two different concrete colors and three different finishes to accommodate the architect’s vision. Precast concrete walls were painted wherever they were exposed inside the facility. “The main goal was to make it as durable as possible for those shop classes,” Armbruster says. In the aftermath of the May 2013 tornado, critical to the new design was the inclusion of safe rooms/storm shelters capable of holding more than 1,300 people. The storm shelters were devised with precast concrete walls and double tees for an above-ground superstructure designed to withstand the 250-mph winds of an EF5 tornado. The team determined that the best solution would be multiple safe rooms spaced around campus so students and faculty would not have to travel far to reach shelter. All five storm shelters comply with the International Code Council’s Standard for the Design and Construction of Storm Shelters (ICC 500) and the Federal Emergency Management Agency’s Safe Rooms for Tornadoes and Hurricanes (FEMA P-361). The shelter in the early childhood development wing has a bathroom, small storage area, and play area. Two of the shelters double as corridors, with the main body used as a common area, meeting room, or study space. Two sets of double storm doors are shut in the event of a severe storm. The largest shelter has offices, classrooms, a storage room, bathrooms, and a large work area. Each area is painted a different color so students know where to go if they have to take cover. Students will also feel more secure with the consolidation into one main building. When there were several buildings across campus, there were multiple egresses. The new campus will be more secure with a front entrance and prominent entryway. Building 100 was finished and occupied in January 2017.